Relinquishing the physical, rising to the spiritual. The dead rise from their graves, responding to the angel's trumpet. The coffins float on water that begins in the robes of the High Priestess. Their solid forms represent our mental structures in the sea of emotion. They are also a metaphor for Final Decisions. The mountains in the background represent the heights of abstract thought. The child's back is toward us, representing return to the source of all. The child is us. Seven lines of sound from the trumpet represent the seven notes in the musical scale, or the seven chakras. This rebirth is the transformative process of evolution we all are continually undergoing. "Shin" means tooth, and suggests chewing, or tearing apart for nourishment. Key 20 shows a pause, a looking back, before beginning something new. Letter Shin, when inverted, has many associations. It has been compared to the "Roots of Heaven," the nivdalim, that transmit sustenance, prana, or "shefa" from the Heavenly realm to the Earthly dimension we see around us. Inverted Shin also represents the nostrils, an idea from the Talmud. Pranayama, a branch of Yoga that addresses proper breathing and breathing excercises, places great emphasis on nostril - breathing, especially during inhalation, and on deep-lung breathing, accomplished by "breathing from the belly." Yogis explain that with proper breathing, Prana, or life force, is better utilized by the body, bringing the mind into sharper focus and higher awareness. In Western parlance, we would say that proper breathing enhances oxygen flow to the brain, increasing concentration. 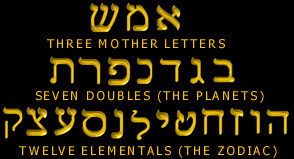 In the cases of nefesh and neshama, letter Shin [nostrils, in the inversion analogy] appears in both words. Both words share letter Nun, which suggests prayer - a kneeling person. Nefesh contains letter Peh, which means mouth. Neshama contains Mem [water - belly] and Heh, the breathy, exhaled letter that appears twice in the Tetragrammaton, or Holy name of God. The Proverb above refers to the Shin/Flame, the Meditator, Mouth and Nose breathing, and the Belly. Humans can partake of the Flame of God through Breathing and Meditation. "Make Alef king over breath. Make Mem king over water. Make Shin king over fire. The head is created from fire, the belly is created from water, and the chest, created from breath, decides between them." Yogis refer to the Ida and Pingala, the Nadis, or energy channels that course up and down the spine in a double helix. These are invigorated by Pranayama, and are depicted in Jacob's dream of the angels going up and down the ladder. Breathe in through the nose, filling the lower lungs by extending the belly, a count of 8. Hold it for a count of 8, then exhale completely, emptying the lungs by pushing with the belly, a count of 8, and hold your lungs empty for a count of 8. Repeat. Hold one nostril shut, and inhale a count of 8. Hold a count of 8, then exhale a count of 16 through the other nostril. Use that nostril for the next inhalation, and repeat the cycle, alternating nostrils. Breath of Fire consists of rapid, even, and deep inhalation - exhalation cycles, with no holding phase. It can be done forcibly or gently. Forcefully exhale, emptying the lungs completely, using the diaphragm to expel the air. Then inhale slowly till full. Repeat. During any prayer or meditation ritual, you can enhance your concentration and understanding [kavanah/dharana] by breathing in through the nose. The exhalation is taken care of with the voice [when verbalizing], solving the issue of evacuating the lungs as completely as possible on the exhale. Important: Use care in breathing exercises. Do them sitting, ideally in the lotus position, but basically any position where the spine is vertical, and not leaning in any way. While doing yoga asanas (postures), use square breathing as much as you can. Apply the principle of deep lung breathing at all times, especially in situations requiring sharp focus and concentration, such as playing a musical instrument, doing mental calculations, confronting danger, reciting or chanting sacred texts, or entering a critical interpersonal exchange. If you have heart problems, consult a doctor. Don't overdo it, and hyperventilate. If you get dizzy, stop and rest, then start again more slowly. Pranayama can be very healing if you have athsma, migraines, or low energy. There are many websites with detailed instructions for all types of Pranayama. 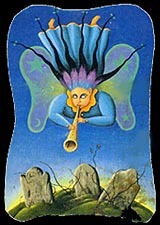 Nefesh and Neshama are depicted in the Judgement card by the three people rising from the coffins. (The three "flames" in letter Shin). "Blessed are You, O King beyond Time, who restores souls to dead bodies"
The Angel, or conduit to the Heavenly dimension, breathes [breath in the horn] soul and life into our bodies, imparting life to what would otherwise be inert chemicals. Shefa is a Hebrew word meaning "Abundance," "by the abundance [shefa] of the sea will they be nourished." (Deut 33:19). Shefa is also defined as "abundant flow, emanation, emission, or influence." Pluto is the lord of the Underworld, the blackest part of the shadow. Pluto's placement at birth influences the person's deepest transformations in life, and the death experience. It teaches the transition from desire to individuate, to the desire to rejoin source. Transits of Pluto bring profound changes, ends of relationships, new beginnings, the realization that some things are obsolete, past their bloom, that it's time for major course corrections. Resistance to Pluto's urgings is futile, and often disasterous. Pluto works on the most deeply ingrained Samskaras. Pluto represents generational evolution; it influences mass changes of thought, and the relationship between the individual and the eternal. Its placement shows where fundamental growth and life developments will occur, and how they will be colored. The breakdown of reality teaches detachment and "composts" things so new growth can take place. Right now, Pluto is in Capricorn, re-booting world politics and government. It went into Capricorn in January, 2008, right when Barack Obama was inaugurated U.S. President ~ a transformational moment if ever there was one. Then, in 2016, we all saw another transformation, of a darker kind, where the shadow has gained ascendency. We can invoke that this 'bringing to the light' of the ugliest of our collective impulses is venting itself for a new and healthier beginning, without all of the calcified Capricornian resistance to progress. My personal experience of Pluto transiting my stellium in Sagittarius for the 23 years (!) before that moment is that the Pluto is ruthlessly thorough, and gets into the deepest, darkest stuff, forcing it into the light. As Pluto transits important places in the natal chart, that is, planets or houses in Capricorn, a person will experience the associated transformations. Squares and oppositions are areas of resistance. Capricorn tends to be inflexible, and resistant to change or correction, so those changes are more apt to be abrupt or traumatic. As with all transformation, resistance makes it worse, and humility and compassion are essential to survive it. Pluto went into Capricorn in January, 2008, and with be there until December, 2024, when it moves into Aquarius. Capricorn is politics and government, systems of management, prominent people and their power manipulations, and financial prudence, among many other things. As we can see, all of these are being re-thought and re-visioned. Pluto shows a person's most profound karmic imperatives, patterns that will recur throughout the life, the hardest habits to break. Afflictions to Pluto create violence, isolation, imprisonment, a living death, deep feelings of seperateness. Pluto benefits include distinction, realization, passing the evolutionary hurdle, transcendence. Pluto takes 247.7 years to complete its orbit through the zodiac. Pluto is the higher octave of Saturn, and rules Scorpio. The Sepher associated with Pluto is Keter.